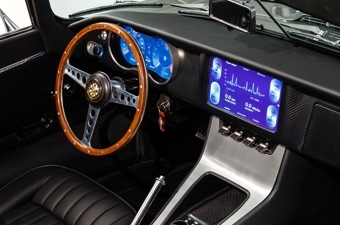 Can modern electronics combine with British style? In our rumblings and ramblings around the Internet, we frequently come across things that prod the flow of our creative juices. We investigate those things in an effort to cull out those subjects which will be unproductive of material to submit for publication. This is a fun way of keeping our subjects non-restrictive and current. It is a method which, admittedly, is directed 100% by our interests, an unabashedly selfish reason, which produces unabashedly selfish results. We hope that the editor will agree with our interest. A Wall Street Journal article (our frequent starting point) brought forth this fact: Jaguar Land Rover (the company) have produced an electric car. No surprise there – every car manufacturer on the face of the planet is producing an electric car. Ho-Hum. A further reading revealed a non-ho-hum fact: Jag E-Type Zero. The E Type. There is only one, and it is by Jaguar of course. Designed and produced originally in 1961 – 1975, Enzo Ferrari, no stylistic slouch himself, called it "the most beautiful car ever made." The Museum of Modern Art got an XKE and put it on display during the 60s; it is kept along with two other cars (Ferraris) on permanent display. The E-type was a head turner and a showstopper. The original E-Type cost $5,595 for the OTS (open two-seater) or $5,895 for the FHC (fixed-head-coupe). (That's $41,000 for the roadster and $43,000 for the coupe in 2011 dollars.) All told, Jag made 72,520 of them and sent 83% abroad. More than 43,700 made it to the U.S.
"I had driven the two-seater XK-E, and as far I could see, the 2+2 handled just like it, which is bloody good. I found it very smooth down the back straight at 110 mph. The seat was fine; the visibility was good; the brakes were solid. There is great appeal in the 2+2 for the man who will accept a compromise. He can put his two kids in the back, run his wife in the front and take off for his vacation." The 2+2 was what the friend in Knoxville had, white in color. This writer's Mustang at the time had cost slightly less than $2,500. The E-type was an expensive car, but nowhere near the stratospheric heights of a Ferrari or its ilk. The friend's car was an absolute joy to drive and a flat-out fast racing car if the need arose, and we would find that need arising with reasonable frequency as we drove through the Smokey Mountains and on roads in the foothills near Knoxville. Not only was it great to drive, but it was fun, like no other, and the attention it drew was a plus; snobbing admirers was a skill we never acquired. We probably spoiled the whole image by gleefully waving back, grinning from ear to ear. Staid aloofness was not a possibility at the wheel of that car. And now there is a version of the E-type that is electric. The original was electric, of course in its enervating ability to quicken the pulse and turn the head, but this electric car is powered by electricity. That is the new de rigueur for performance machines. Jaguar has prescribed a retrofit electric power plant which replaces the engine, the the driver's environment, and other aged portions of the classic car with all the new stuff to make the car suitable for tooling I-95 or any bendy road at a respectable speed. All that is needed is your old E-type and a very deep pocket ($300,000 +). At Jaguar Classic something very special is on the horizon. 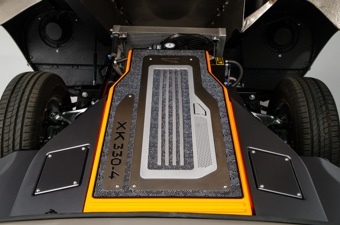 In today’s increasingly environment‑conscious age, we will soon be offering electric powertrain conversions that preserve the looks, handling and performance of original E‑types – yet deliver zero tailpipe emissions. These conversions will be fully‑reversible and can be applied to any 6‑cylinder E‑type engine. But what you get is a resurrected E-type: 'Sweet Dreams are made of this' to borrow a phrase from Chrissy Hynde of the Pretenders. It is unclear whether the vehicle will be available in a fully ready-to-drive version from new parts, or if a vintage machine is required. For the third of a million dollars, that's a lot of retrofit. Even without the double-charge, $300 K sounds a bit rich for this writer's blood, so we went in search of an electric version of our old MG-B on the web. 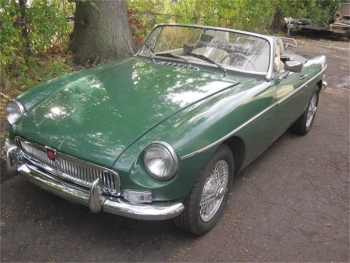 That MG was a wonderful car - simple, do-it-yourself maintenance; fast enough without breaking the bank; and it was New Racing Green, the evolved color for British racing that replaced British Racing Green. When the wife's Honda cost ~$12,000, my new B was just over $10K. Memphis, Tennessee was our home at the time; it was a 1980 model year, the last of the venerable MG machines. We worked downtown where we had to rent a parking space in a garage near our office building; a considerable expense at the newly registered architect's salary, but a heavy benefit for a convertible owner. The top would go down in April, and stay down until Halloween, with only a few days when it would be needed. A little weather consciousness was necessary, but top-down season could last for seven months; even more when sporadic days during the rest of the year allowed a top-down drive. This became a way of life. Our job required frequent trips to inspect construction and to attend jobsite meetings– tasks that were taken on gladly. There were other duties that required our presence, and we volunteered for these where appropriate. There were also opportunities presented for other responsibilities to be handled in a fun fashion. For one, speakers for our AIA (American Institute of Architects) meetings had to be ferried from the airport to our meeting venue at the Memphis Academy of Art. There was Bill Caudill (Principal of CRS, a large Houston firm), who insisted upon driving so he could compare the MG to his Jeep, and Fay Jones announced that he had won the annual nationwide AIA Gold Metal that evening. He had helped change a flat that afternoon on the trip from the airport. These two world-renowned architects allowed the MG to draw them out of their usual lofty presence to show that they too were real. And the British couple who my parents swapped houses with one summer – they gladly piled their middle-aged selves into the B's one passenger seat, exclaiming "Bloimy, it looks like an MG."
The car was unmitigated fun and a remarkable piece of memorable transportation. That MG-B was among the last two or three thousand made. Its passing was mourned when the decision to make Florida home required that it be sold in an unrepaired state so that all possessions could be moved in one truck towing the Blazer. The opportunity arises for the new MG, which will now become a product of China. It turns out that there are Chinese executives who see the value in the British heritage of beauty and utility. Chinese bought the brand and are planning a resurgence of an MG soon. They proclaim a rival to the highly successful Mazda Miata, a fine little car, fun and capable, although its addition of creature comforts to the marque seems to discourage the use of the convertible top. The everyman sport car seems to demand that the owner suffer some in the unconditioned outdoors. But that attitude is a relic of bygone days and only we curmudgeonly few wish to see a return to sweltering at stop lights. Roadster is the root of the MG, and the Chinese proclaim their intent for its return. 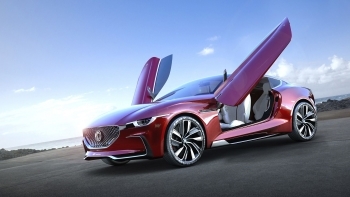 However, the photographs of the E-Motion (MG's concept car) show only a vehicle with enclosed passenger compartment that resembles a Mustang fastback more than anything else. But if their spirit and pocketbook are willing, a more faithful adherence to the lineage of Brit sport vehicles may be found. The essence of the evolving electric sport car may be found here, but they are all absurdly expensive, beginning at about $80,000. The disparity between the prices of these cars and the cars that we drive is a good bit more than the disparity between sport cars and family sedans has been traditionally. A mass-market sport car is only a viable alternative if it is sort-of affordable. This writer chooses luxury station wagons and SUVs, but the price tags of the sport cars included in the referenced list are high. Even a glimpse of the dollars involved is not for the faint of heart. We thus devolve our criteria from true sport cars to merely sporty cars so that we get financial relief. But then, we run into the barely disguised family sedan or the tiny euro car marketed (falsely) as a fun-to-drive alternative. In this case fun-to-drive means merely a model severely lacking in creature comforts, including legroom. Gone are the days of the true Brit sport car, where the body, while beautiful, was merely a shell to keep the weather off the mechanics of the car; keeping weather off the driver and passengers was an afterthought. But boy, those cars were lovable and fun. About that song "Sweet Dreams Are Made of This"... always thought that was a Eurythmics song. I have that on CD, if the Pretenders or Chrissy Hind ever sang it then you taught me something new. I coveted English sports cars when I was very young, but never could afford one. But had a few sporty American and Japanese which were fun to drive. Ah, the XKE Jag, what a beauty. I remember being a teenager in Texas sometime in 1967 when my buddie's uncle visited in a drop-dead gorgeous XKE Convertible in BRG with a large yellow number plate stenciled across the 'bonnet'. The wire wheels were very cool, the camel colored leather upholstery contrasted the racing green paint so nicely and the array of long, pointy toggle switches for the various electrical functions (lethal by today's standards) looked like something out of 007's Aston Martin, obviously for ejector seats and and taillight oil slick devices! We drooled over that car all afternoon and it is an experience I'll never forget... my first XKE sighting. I agree that it is one of the most gorgeous cars ever made.